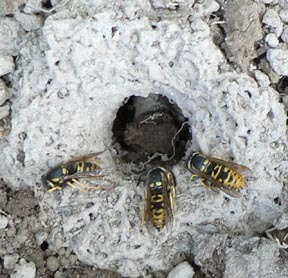 Yellowjackets typically build their nests in the ground, but will nest anywhere then can find an appropriate void. We remove many every year that have built their nests in wall cavities and attic voids. 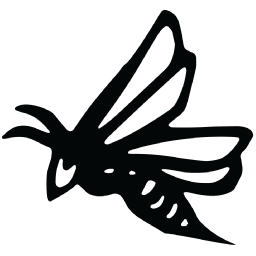 We will happily remove your ground nesting Yellowjackets free of charge, without the use of chemicals! Colonies are initiated by the queen after coming out of hibernation in the Spring, typically in mid-June in our area. Once she finds an appropriate site, she begins to build her nest. 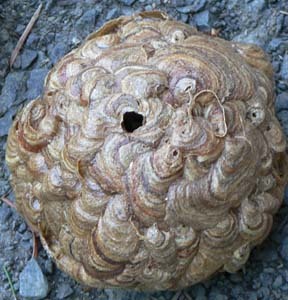 Nests are made from chewed wood fibers mixed with saliva. The queen continues to forage for construction materials and food until four to seven workers have emerged. At this point, the queen focuses solely on laying eggs as the nest continues to expand. Usually in September, males and queens are produced, which then leave the nest and mate. The nest begins to decline around this time, the males eventually die, and the inseminated queen goes into hibernation for the winter months. The inseminated queen is the only member of the colony to survive winter in our cooler temperate climate. In the absence of cold weather, these Vespids can create enormous perennial nests. Their populations can explode and they have become particularly invasive in the Hawaiian islands, New Zealand, and other areas of the world with similarly warm climates. Vespula species feed on animal prey such as caterpillars to feed their developing larvae and carbohydrates such as nectar and sweet fruits to satisfy their own energy requirements. They will also attempt to invade honey bee hives to steal their honey. The other species of yellow jackets less commonly found in our area are V. atropilosa (the prairie yellow jacket), V. acadica (the forest yellow jacket), V. arctica and V. consobrina (black jackets). Black jackets are black and white in color, they have no yellow markings, and are often mistaken for bald-faced hornets. V. arctica is unique in its behavior in that it parasitizes the nests of Dolichovespula arenaria. Overwintered queens emerge from hibernation in the Spring, find an aerial yellowjacket nest, kill the queen, and utilize the workforce of that colony to rear their own queens and males.